Beatrix Jones Farrand was born into one of the wealthiest families of old New York – and the “keeping up with the . . .” reportedly refers to her family! This niece of Edith Wharton took up landscape design in her early twenties, confounding what was expected of such a grand young woman in the 1890s. 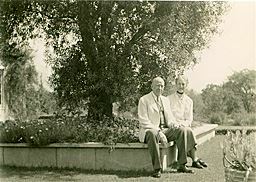 In 1927, her husband historian Max Farrand was appointed director of the Huntington Library – and Southern California would be blessed with Beatrix Farrand gardens: the director’s house at the Huntington; the courtyard of Dabney Hall at Caltech; parts of Occidental College; and the Santa Barbara Botanical Garden among them. On Saturday’s tour we will explore the remnants of a few of her gardens. On Sunday, November 14 at 2 p.m. garden historian Judith Tankard will discuss her latest book, Beatrix Farrand: Private Gardens, Public Landscapes at the Huntington Library, Art Collections, and Botanical Gardens.